FileStream TurboBackup lets you backup E-mail, registry, system settings, files, folders, and drives to CD/DVD, Disk, Network, remote server, on demand or via scheduling. Recover data from hardware failure, software error, or virus attack. It offers Zip and proprietary compression with encryption; performs full, incremental and differential backups with optional filters. FileStream TurboBackup comes with step-by-step Backup and Restore Wizards. ...... iTunes, Pictures, Videos, BlackBerry, and with Windows Vista. FileStream TurboBackup 8.0 helps you to easily back up any types of critical data to secure places that you are comfortable with; and restore is just as easy. For new and experienced users alike, the FileStream TurboBackup Prepare Backup function lets you know ahead of time how much data will be backed up and gives you an estimate about space requirement and the number of discs needed for the backup. 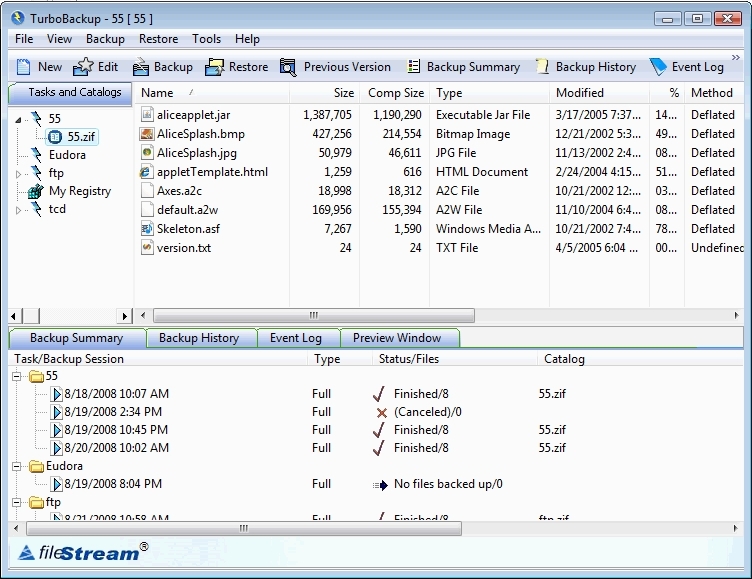 Many FileStream TurboBackup users have been using it for backing up work, synchronizing between Laptop and Desktop computers, exporting data to offsite locations to prepare for disaster recovery, or archiving their personal data to DVD or Memory Stick for sharing or storage. In addition to full and partial restores, the Previous Version function gives you all the backups of the same document so you can decide which version to restore. Qweas is providing links to FileStream TurboBackup 8.0 as a courtesy, and makes no representations regarding FileStream TurboBackup or any other applications or any information related thereto. Any questions, complaints or claims regarding this application FileStream TurboBackup 8.0 must be directed to the appropriate software vendor. You may click the publisher link of FileStream TurboBackup on the top of this page to get more details about the vendor.